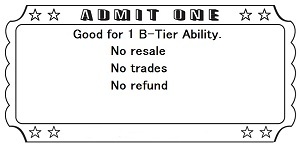 Personality: Personality: Lance is a villian through and through and the only reason he has White Ruhk is because he has accepted his past, he just wants to make the world pay for it. He has been through some major changes in personality, making him the perfect villian on the outside. Lance is very calm and it is rare that anyone shall see him be over excited about anything really. The calm, mellow look in his eyes is almost always there unless he does get excited about something. He is also very charming and knows how to use and twist people to his own ideals by resorting to anyhting from sweet talking to flattering. Let's just say he likes to get what he wants and becomes upset when he doesnt get it. He likes to trick people into doing his biddings as well by telling them that it's for the "Greater Good of the world", making him very Deceptive. Lance is also very Intelligent from all of his times in the "Sancutary" studying up on the world and magic. He locked himself away from a few months in order to study and become smarter in magic and in the world. One thing thats helps with his Intelligence is his ability to Observe situations and adapt/act upon them accordingly, meaning unless you sneak up on him its hard to catch him off guard. The young man is also very cocky and very sarcastic for the most part. He always has something witty or some rude comment to make. One thing that makes him so unnoticable is how cheerful and mellow he is on normal occasions. He pretends to be very friendly and outgoing in order to mask his true intentions most of the time. Nehind this "Mask" however, Lance is a total Barbarian and will not hesitate to kill and torture if someone makes him mad enough. One last thing about Lance is that he is very single-minded, He thinks that what he is doing is right and that his goals are the only true solution to problems. One thing in particular however could possibly knock down Lance's whole villainy. He cares a lot about his family and friends. He will do anything for his Orphans or the people who have accepted him while knowing that his mind has snapped. This could prove very detrimental to his plans in the future, and he knows it, but this is one thing about himself that he can't change. He also is always willing to lend a helping hand to someone with a task or need, especially when it comes to slavery. Destruction/Death: Just the smell of chaos and blood makes him excited and happy. Gold and Treasure: He desires to be powerful and he sees one of the ways to do that is by getting rich. Drinking: He drinks a lot of alcohol for the pure pleasure of enjoying it. Slavery: He grew up as a slave to his dad. His dad beat him and tortured him relentlessly. Being told no: This is apart of his massive ego. He will get upset when he isn't allowed to do something and if he doesn't show respect he may just attack. Breaking down: He is afraid that his weakness of caring a lot about people will eventually lead to his plan failing or him dying. Recently, he has become aware of his emotion to love humanity so he can already see himself nearing the breaking point. His love for humanity and his generosity for people in need may lead to his "Perfect World" crumbling beneath his finger tips which is something he doesn't want. He will keep his mask up for as long as he can hold. Making the world fear him: Lance has lived a life of slavery and pain for almost all of his life. He wants to make the world pay for what it did to him and will kill everyone and everything that stands in his way of becoming the strongest, richest, and most powerful man alive. He believes that he will achieve this goal one day and wont stop until he does. He will even put his life on the line to fight for this goal. 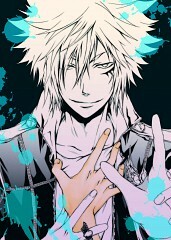 Face-Claim: Byakuran from Katekyo Hitman REBORN! Appearance: Lance has two different outfits: He usually wears a black jacket with a white under shirt along with some blue jeans. Then he also has an outfit that he wears on occasions which is a white suit with his collar covering his neck along with white pants. He carries his staff on his back just in case he ever needs it. He has his hands either moving freely or stuffed in his pockets most of the time. His hair is long and goes down to the bottom of his neck while his bangs sometimes cover one of his eyes. His has a tattoo of three triangles underneath his left eyes. On his right shoulder, hidden from view, he wears the symbol of the "Paramyriad" which is the group he has pledged himself to. On his right wrist he wears a black bow, symbolizing the friendship between him and another individual. History: Lance was born into poverty and slavery. His mom had gotten killed by their owner the day he was born and he himself was taken in as a slave in her place. He got beat almost everyday and he never got a break. Everyday it was work after work and he hated it. He begged his master to let him rest but the answer was always no and then got beat for asking. It would be a few years of the work before he finally stood up and killed his master. He felt true strength for the first time and that wasn't the last time he felt strength like that. After he killed his master he used his power to set free all of the slaves that he could and helped them escape. He ran for what seemed forever until he reached a caravan with a man on it. He faked being hurt and made the man feel sympathy for him. The man helped him on the boat and took him to Heliohapt upon request. The man and his crew took care of him for the next few days until they got to Heliohapt. Once they got there however, instead of Lance thanking them or paying them he destroyed the caravan and killed everyone in it before running off and hiding somewhere. He ran into an alleyway and saw some homeless kids laying on the ground. He sat down next to one of them and quickly became their friends. He had a new family and he would lead them onto stealing and killing just like him. He had the most fun in his life for the next few years of his life until the kids were killed because of their actions and his staff broke in the process. The world had killed his only family he ever had and he was going to make them pay. He would stay there for a few more years until he finally got a new staff and gained enough strength to continue on wards. He formed an Orphanage in Reim where he took care of and housed kids who didn't have a home. Along the way he made three followers: Amber, Drake, and Rose who have since joined him in his journeys. Eventually the Orphans saw Lance as their god and the Home became a church for people who wanted saving and who wanted to contribute to his "New World". He met many people a long the way from kings to friends. He formed bonds with these people and he in turn learned to have faith in people once more. A certain girl he met taught him how to love and melted the chains that he kept around his heart. However, this girl did not love him back, Lance left on good terms and swore that they would meet again someday. In an attempt to save Lance's and his friends life the girl killed his father and gained the gratitude of Lance. He traveled back to Reim where he kept himself locked in the church. A few months later, in an uproar from the public, a lot of things where burnt down including his church. He has since found a new place in Reim, a warehouse where he and the orphans could call home once more. The burning of the church has left him with an even stronger resolve to inflict pain the the world however. He made his way to Magnostadt where he has claimed residence and is now studying to get stronger. Role-Play Sample: Lance ran as fast he could through the streets of Balbaad trying to get away from the people chasing him. The wind raced fast him and through his hair as he ran. The world around him would be almost like a blur and he was running until he could breath anymore. Eventually he would reach a caravan with a couple of guys in it. He slit his leg open with his finger nails and winced "S... Sir.... P... Please Help...." He muttered as he limped over to the caravan. The man just smiled at him and nodded as they helped him up to bandage him up. He acted nice for the next few days as then men fed him and cared for him. Once they reached Heliohapt however, Lance would hop up the caravan and grab his staff of his back before shooting a single fire ball and destroying the small caravan and everything in it. Lance walked away laughing "See you on the other side!" he said as he walked off into the distance. [b]Requirements/Drawbacks:[/b] Lance has to point the staff in the direction of where he is placing the wall. [b]Scaling:[/b] The wall will become bigger by 5m for every 10 Magoi spent. [b]Description:[/b] The caster creates a 5m x 5m heat wall within ten meters of the caster. Magoi pours from their staff to the wall. The heat from within the wall creates a mild mirage that obscures vision for the opponent or opponents on the opposite side of the wall. [b]Requirements/Drawbacks:[/b] Lance has to point his staff at the target he is shooting at. Can only shoot one at a time if he changes targets. [b]Description:[/b] Lance creates 1 flames of heat, 1 meter large, that forms and shoots at targets with the point of his staff. The flame can inflict D-tier damage and inflict first-degree burns. [b]Requirements/Drawbacks:[/b] Lance has to slice his staff through the air, horizontally or vertically, in order to shoot the Flame Slice. 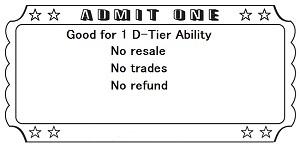 [b]Scaling:[/b] Adds an additional tier of damage per 10 magoi spent. [b]Description:[/b] By slicing his staff in the air, Lance creates a crescent of flames 10 meters long and 1 meter wide that forms and shoots in a direction of his choosing, capable of inflicting C-tier damage and second-degree burns to any opponent it touches. [b]Requirements/Drawbacks:[/b] Lance has to point his staff at the target. [b]Description:[/b] The caster creates one fireball up to one meter in diameter that travels up to 20 meters away from the user capable of inflicting C-tier damage and second degree burns to an opponent. [b]Requirements/Drawbacks:[/b] Lance points his staff at the target. [b]Scaling:[/b] The flame grows 5 meters in every way for every 10 Magoi spent. [b]Description:[/b] A bright light emits from the orb on Lance's staff and a burst of flames comes out. The burst is a flamethrower like attack and has a 10m long, 2 meters wide and 3 meters tall. The flame burst flies at the enemy and tries to engulf them in flames. If they get engulfed it causes 2nd degree burns to numerous parts of the opponent's body. [b]Requirements/Drawbacks:[/b] Lance has to point his staff at the object he is heating up. [b]Description:[/b] A bright red light flashes from Lance’s staff and the area around an allies attack starts to heat up enough. He can scale the ability in order to use it on more than one ally. The allies attacks now cause Second-Degree burns and a C-rank damage when they hit an enemy with their weapon. [b]Scaling:[/b] Double the amount of snakes made by this ability for every 10 magoi spent. [b]Description:[/b] A bright red light flashes from his staff as a snake like flame comes out from the staff and tries to strike the opponent. The flame is 10 meters long and 5 meters in width. The flame causes 2nd degree burns to the part of the body it strikes and and causes C-tier damage. It disappears after it strikes. 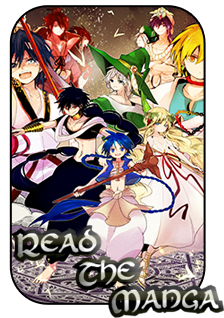 [b]Requirements/Drawbacks:[/b] Lance has to touch himself with his staff. [b]Scaling:[/b] The aura around him expands by 5m for every 10 Magoi spent. Using the Magoi around him, Lance starts radiates and pushes heat/fire away from him dealing C-tier fire damage to anything within 0.5m of his body. 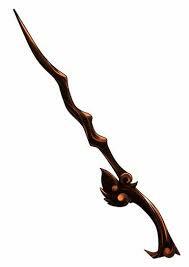 Appearance: The Staff is made of dark brown wood and has orange like gems in different places on it. The staff is about 5"1(152cm) but strangely light in weight. Whenever Lance uses magic the gems seem to glow a bright Orange color. 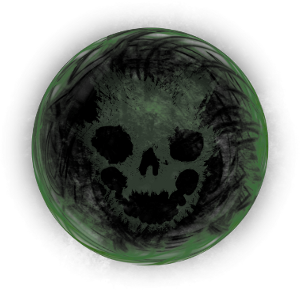 Appearance: A sickly green orb about the size of a palm with a skull reflecting in the middle. 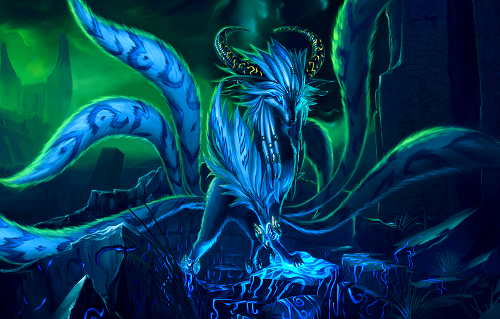 Appearance: A five meter tall plague fox with five tails, capable of comfortably carrying four people on its back. Can carry up to four people while moving.